As a JET participant in Saga, you can be pretty sure that there will be ample things to keep you busy and connected to your fellow JETs. Below are just some of the events that are held annually in Saga each year. The actual selection of events will depend on the AJET Representative and your local community. For more things to do around the prefecture, check out the cultural pursuits and volunteering pages. Also be sure to look at each District’s page for a description of what happens locally. The events are listed below are in the rough order that they often occur throughout the year, beginning in July when new JETs first arrive. What: One of the first gatherings of the year, this is the first time when JETs from different districts gather and mingle. Food is usually provided and cooked by the Kito DR(s), and attendees chip in to cover the costs. Where: Usually held in a lake-front park in Takeo, in front of the Space and Science museum. The park has some pavilions with seating available for booking from the local city office, and a large grassy area. The closest train station is Takeo-Onsen. When: Usually held on a weekend in mid-August. 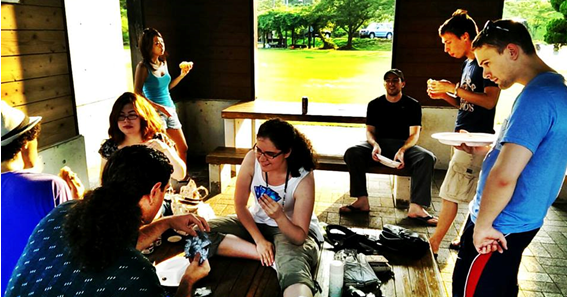 What: BBQ party held in Karatsu by the beach to welcome new JETs to Saga. Traditionally this has been a casual BBQ held right on the beach, using one of the pavilions along the boardwalk. Similar to the Takeo BBQ, the Tomatsu DR(s) will supply the food and attendees pay to cover the cost. This is usually an all day/night event, depending on the weather. Where: Held at Karatsu beach, usually either the Hamasaki end or Nishinohama end. Parking is available, and the nearest station (Hamasaki or Karatsu, respectively) is a short walk away for those coming by train. When: Often held the 2nd or 3rd weekend in August, right after the Group B JETs have arrived. What: An event officially organized by Saga City in which teams of people compete in dragon boat races along a short stretch of the Kase River. Usually JETs form the bulk of a special team sponsored by the Saga Prefectural Office. There is a shelter and food provided for participants for a fee of around 2000yen (which also includes event registration, insurance etc.). Definitely a must-do for all new JETs in Saga! Where: Kasegawa in Saga City, near Shinrin Koen. There is no station near the site, so access is via car only. Usually participants with cars will help to arrange lifts from various nearby stations as required. Taking a taxi and biking are also viable options. When: Happens on the last weekend of August, soon after the new JETs arrive. It is in the height of summer and runs all day, so is insanely hot. Be sure to bring hats, sunscreen, and fans. What: Saga Prefecture’s crown jewel event, where hot air balloon teams from around the world converge on Saga for a week or two in November and take their balloons up every day. Early each morning dozens of balloons can be seen taking off and drifting over Saga, while in the evening there are many novelty balloons that are tied down and lit up for people to see up close. There is a ton of festival food and drink available for purchase, as well as some market stalls with more food and goods from around Saga. Where: Takes place along the banks of the Kase River in Saga City. There is a temporary train station on the Karatsu Line called “Balloon Saga” which is open for the duration of the balloon festival for easy access, and special buses are available from Saga City. Alternatively, parking is available, but is extremely crowded on the weekends. When: Held over a week-long period at the beginning of November, with the best time being the first weekend. Weekends are very busy, so it may be best to check out the night-time events one day after work. More information and image source here. What: The largest traditional festival held in Saga Prefecture, and registered on the UNESCO Intangible Heritage List. 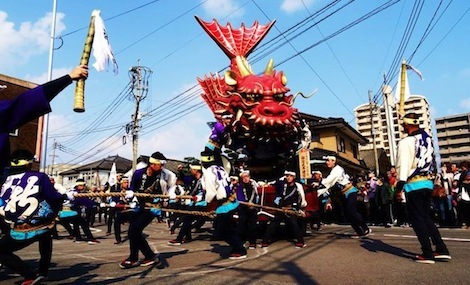 Featuring fantastic old painted floats, teams of float-pullers dressed in traditional festival coats, and ample beer and sake to keep the teams in high spirits, this is the festival that Karatsu residents live for each year. The floats, representing the different neighborhoods of Karatsu City, are towed around in a procession that weaves its way through the city and is accompanied by the endless chant: ‘enya enya enya!’. Truly a spectacle not to be missed. There are both night and day parades, ample festival food stalls, and people-galore. On the second night, when the parade finishes, many Karatsu folk hold parties in their homes with even more food and drink, and it is not uncommon for strangers (especially foreigners) to be invited in to these parties. When: 2-4 November, where one of these days is usually a public holiday. Whether JETs are easily able to attend the night parade on the first day, or just the daytime events, usually depends on which days of the week the festival falls. Also note that this timing generally coincides with the Saga Balloon Fiesata, too. What: A tour around the main sites and attractions in Arita to showcase the town’s history of pottery and porcelain. Usually includes a visit to Arita’s Touzan shrine with its porcelain torii gate, a tour around the old back streets of the pottery district, a visit to a working kiln, a delicious traditional Japanese lunch, and an opportunity to paint your own piece of porcelain. The tour is organised and promoted by the Tourist Division in Arita and is run by the local Arita CIR (in English). It is mainly JETs who attend this event, although it is open to other participants as well. Be sure to like the “Discover Arita” Facebook. When: Held in March in conjunction with the hina-matsuri (dolls/girls festival). What: A pub quiz event where teams of JETs plus friends compete to answer trivia questions and win prizes. Usually organised by the Karatsu JETs or AJET Rep.
Where: For the past couple of years, has been held at Lagoon Bar in Karatsu, very close to the station. They have a nomihoudai deal and have Costco-style pizzas and other food available for purchase. When: Can be held at any time of the year. 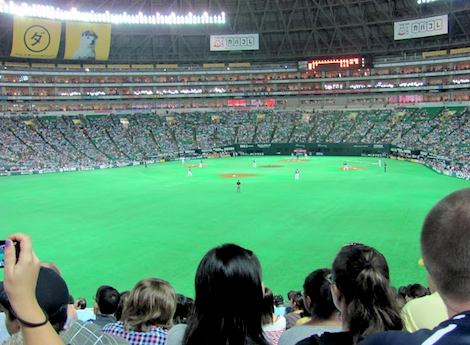 What: Soccer matches are held regularly at Best Amenity Stadium in Tosu. The local team – Sagantosu – was promoted to the J1 League (the top professional league in Japan) in the 2012 season. Tickets can be purchased at the stadium or at automated ticket/booking machines in 7-11 stores. Where: Best Amenity Stadium, Tosu City. The stadium is right next to the station, so access is very easy. Parking also available. 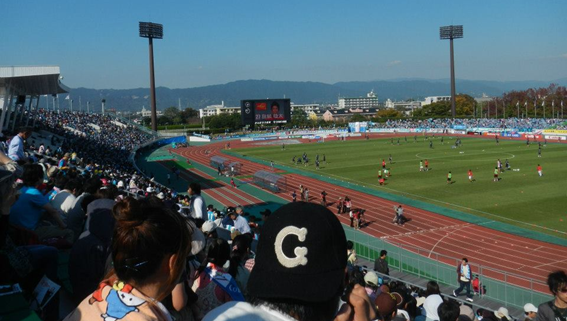 Occasionally games are also held at the Sougou Ground, in Saga city. When: The season runs from March until October. Schedules can be viewed online from February. What: Afternoon picnic under the beautiful blooming cherry blossoms. Depending on the location, you may need to bring your own food or you can purchase food from local stalls. When: Depends on when the blossoms bloom. In Kyushu, this can be anywhere from late March to early April. Where: There are beautiful places to see cherry blossoms all over the prefecture. Some famous locations include Ogi Park, Kono Park and along the Tafuse River. What: A famous event held on the mud flats of the Ariake Sea, in Kashima. The event is comprised of a number of ‘Olympic’-style events that change slightly from year to year, including things like Women’s Sumo, The Gatalympic (obstacle course), Gata-chari (riding a bike along a thin strip of wood), Matchmaking, Human Mudskipper, and Tug of War. Registration information also changes from year to year, so be on the lookout for how to sign up for the JET team. Where: Held on the mudflats of the Ariake Sea in Kashima, at Nanaura Kaihin Sports-en (鹿島市七浦海浜スポーツ公園). Access is via Hizen Nanaura station (about 5-10 mins walk away) or there are around 600 parking spaces available in the immediate area. What: Day-trip to Yafuoku! Dome in Fukuoka to see the resident Fukuoka Softbank Hawks take on their opponents in the Pacific League (or an inter-league game). The Hawks were the champions in 2014 and 15, so they are a reputable team with a big following. Where: The Yafuoku! Dome is near the waterfront in Fukuoka City. Take a bus from Hakata (bus center next to the station) or Tenjin (in front of Solaria Plaza). It can also be accessed from Toujin Station, followed by a 20 minute walk. When: The baseball season runs from May to October. Schedules are available online from February. What: A festival to view and appreciate the beautiful hydrangeas that are planted all around a very pretty waterfall in Ouchi. One of the busiest times to go and see this beautiful waterfall, but also one of the prettiest. There are some roadside stalls with local produce, hand made goods, and ice cream. At other times of the year you can drive right to the base of the waterfall, but since it is so busy at this time you need to park much further down the road and walk up the hill on the nice forest track along the river course, or there are periodic shuttle buses for those unable to complete the journey on foot. Where: Mikaeri Waterfall in Ouchi (part of Karatsu City). When: Early-mid June, depending on the flowers! What: Party to say farewell to the JETs leaving Saga at the end of the current contract. Typically has an ‘awards’ ceremony, where prizes are given based on nominations and votes amongst the Saga JET community, for things like Mr/Mrs. Nomihoudai, Mother Hen, Most Likely to Get Out of Bed at 6am on a Sunday, Turning Japanese, Social Butterfly, Keitai Bling Bling, etc. Generally the majority of Saga JETs attend this party, making it one of the largest social events each year. Where: Usually at an izakaya or other event venue in Saga city. When: Usually held on the last weekend in June or first weekend in July, before the leavers get too busy and bogged down in packing and their own smaller farewells, enkais etc. What: International ‘Shower Climb’ event held in Nanayama town, in Karatsu. 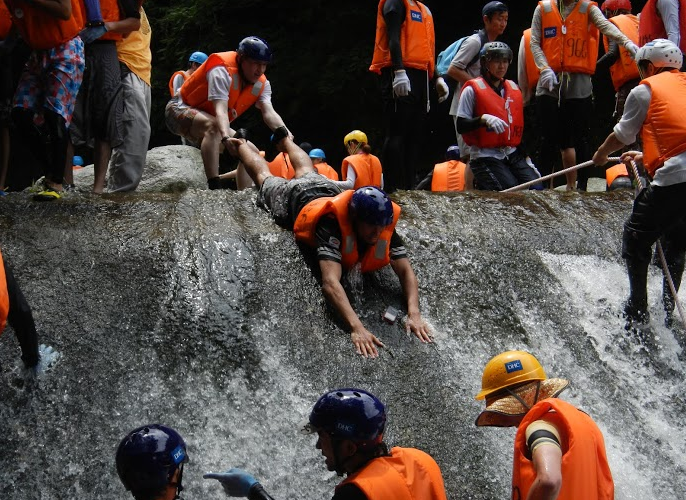 The event is a professionally organised annual event that involves registered participants walking up a river and climbing up small waterfall sections of the river during the heat of summer. Not a race, participants are encouraged to take their time, enjoy the natural beauty of Nanayama, and have a good time in the cool waters of the river at the height of the summer season. All participants are required to wear a life jacket and helmet, and there are many officials along the course route to supervise and assist in the case of any misadventure. Where: A river valley in Nanayama town, in Karatsu. The meeting place is a school ground close to the start of the waterfall climb. Not accessible by train, participants either need to find a lift with a fellow driver (plenty of parking available), or there is a bus that departs from Saga station in the morning and returns there later in the afternoon. When: Usually held in the last weekend of July. Unfortunately since the registration is earlier in July, newly arrived JETs are usually not able to participate in this event and will need to wait until their 2nd year. What: Various events organised by the Block 10 AJET Rep, who is responsible for bringing together JETs across the Fukuoka, Oita, Saga and Nagasaki prefectures. Past events have included a shinnenkai (New Year) party and outings to the baseball and sumo in Fukuoka, the annual charity bike ride in Oita, a huge scavenger hunt, a trip to the lantern festival in Nagasaki, and a combined Balloon Festa and Karatsu Kunchi extravaganza in Saga. These events are a great way to meet JETs from all over northern Kyushu and see more of our beautiful part of Japan. To stay connect to Block-wide opportunities and events, be sure to join the Facebook group. Where: Various locations all over the northern part of Kyushu. When: Can be held at any time throughout the year.